Browse through 12+ years of Natural Life News. Download selected PDFs for free. Cutting-edge articles on healing, longevity, new science, and ancient wisdom. Practical how-to tips on staying healthy, wealthy, and wise from some of the West’s most influential writers. Join us “pioneers” in bringing preventative and alternative natural medicine back to the people! 6 issues (1 year) = $15 (US), $20 (CAN). ANY SIX ISSUES may be purchased using the ABOVE two buttons (U.S. or Canada). Just E-mail Me and tell me which 6 issues you want. See Archives. ANY ONE ISSUE may be purchased using the BELOW button (U.S. or Canada). If you want any issue OTHER THAN the current issue, just E-mail Me with which one. 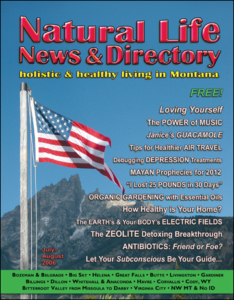 Want to Advertise in Natural Life News?